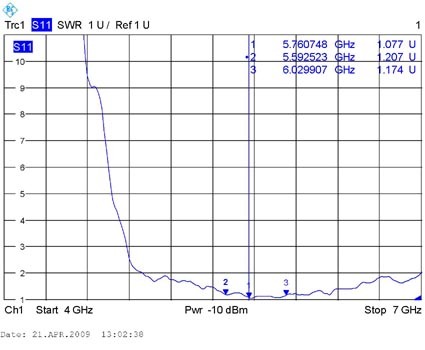 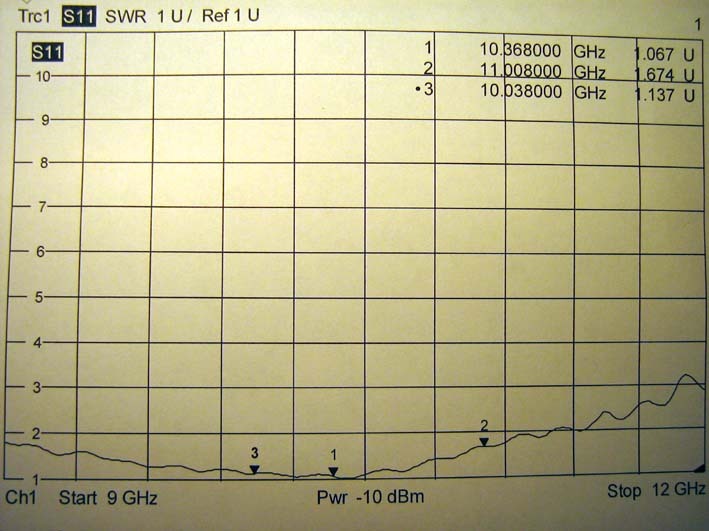 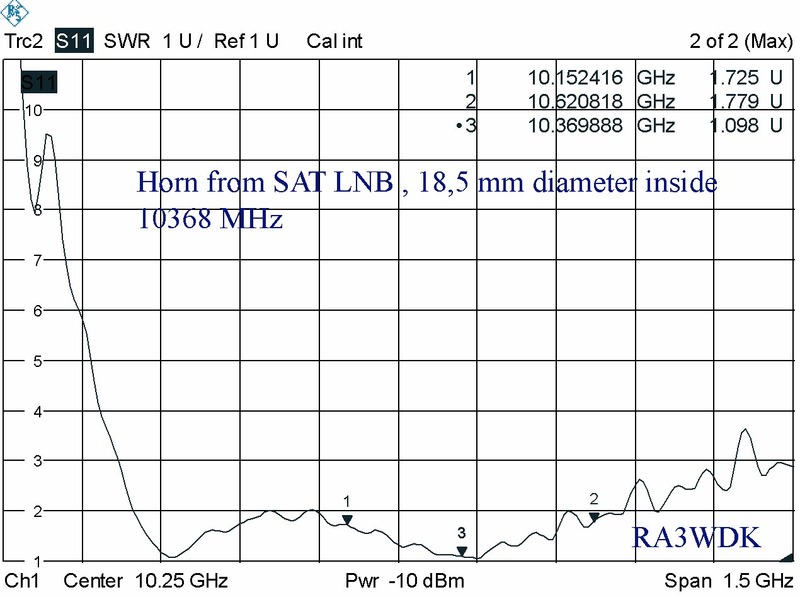 Ham`s who work on SHF band from field condition or with small setup know many reason to have a multiband antenna system. 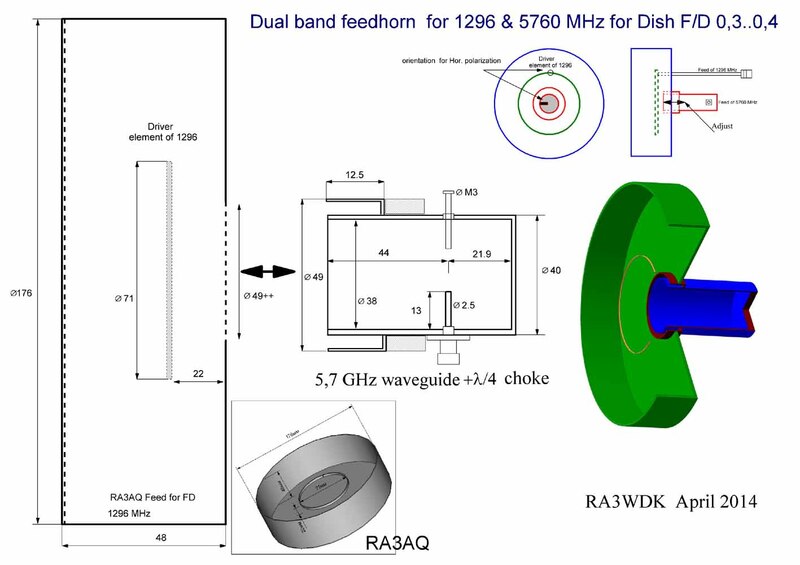 Dish is very effective antennas for 23 cm band and above. 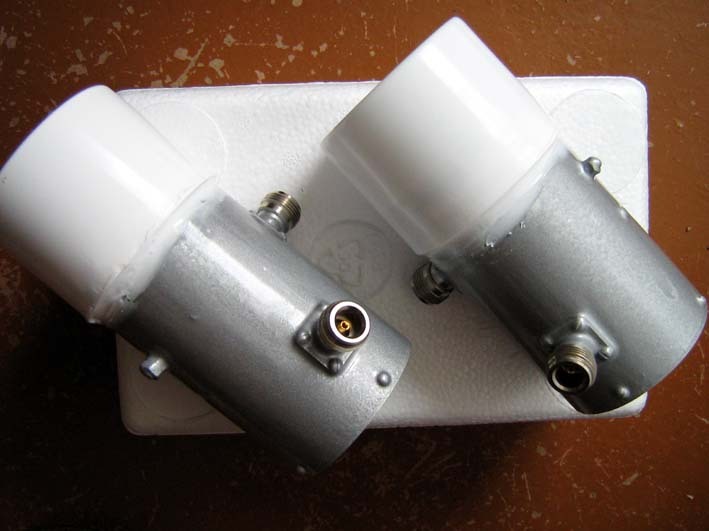 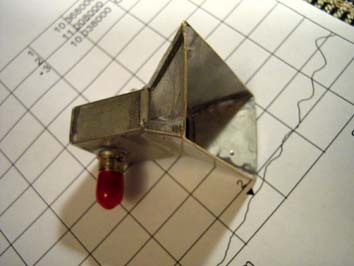 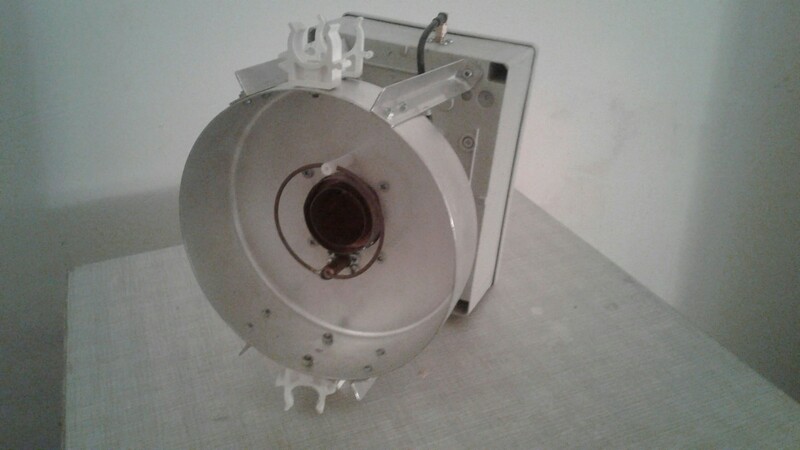 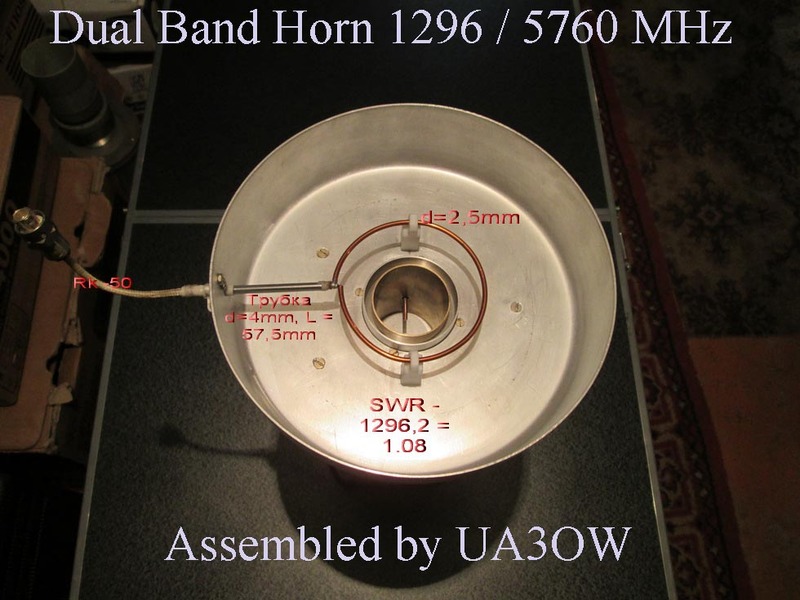 Many Ham`s use one dish for some bands by change feed horn or antenna module. 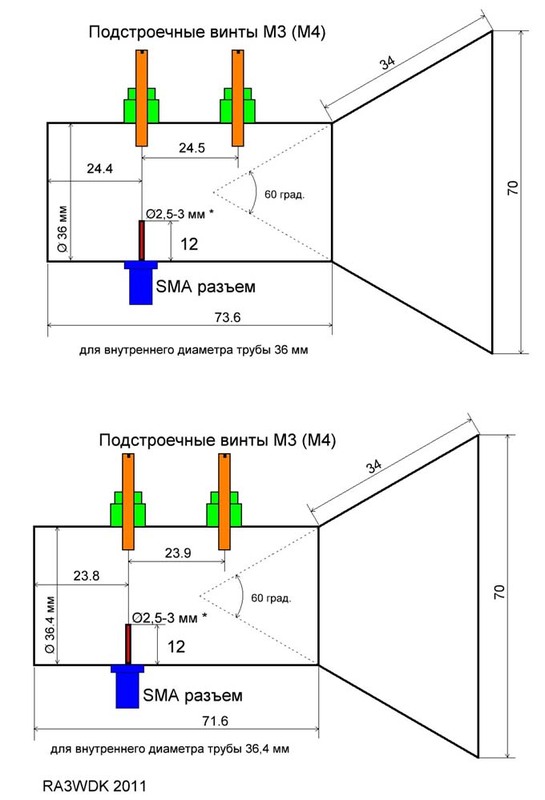 For example i also use two changing modules of 6 and 3 cm band for small offset TV SAT dish . 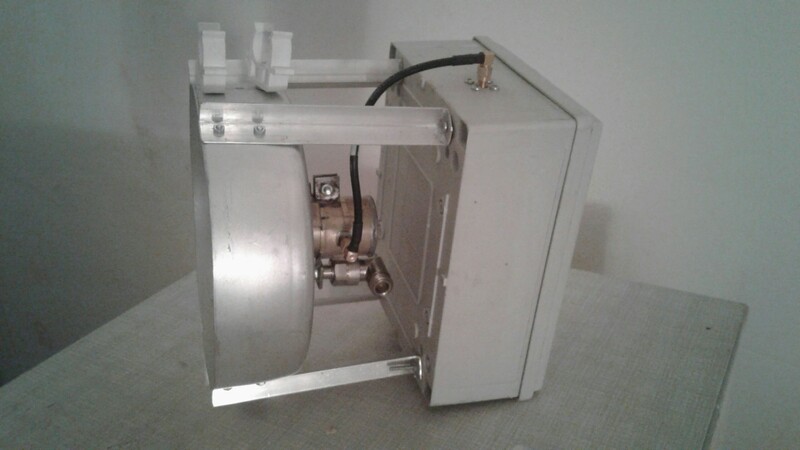 DL4EMA Guenter made loop feed of 23 cm band for prime focuse dish and RA3AQ Dmitrij  made some different design of loop and diameter of reflector. 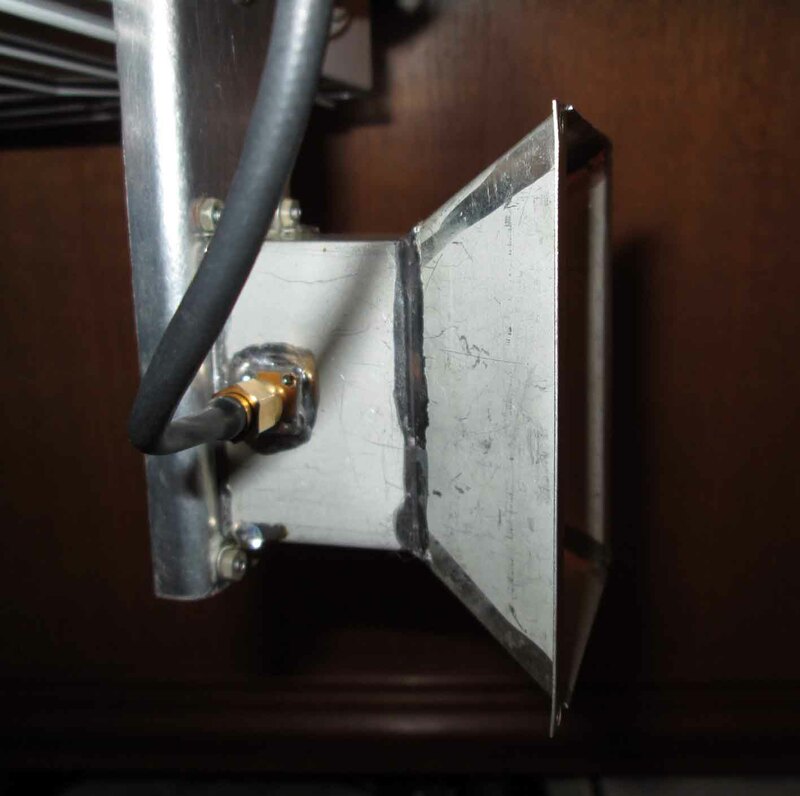 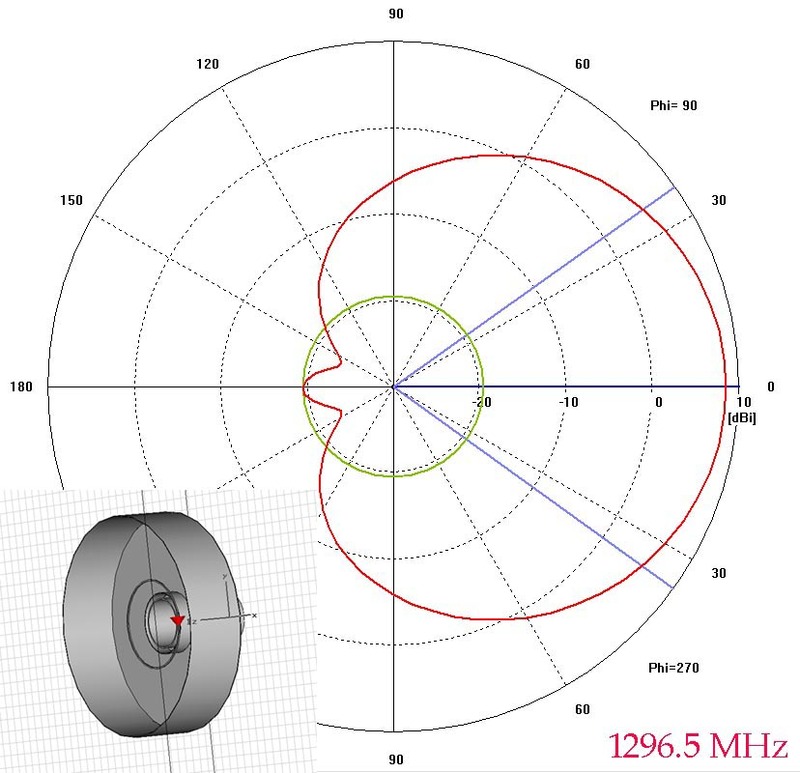 The main advantage of a loop feed is very simple mechanical configuration and good performance of antenna system for Field days and QSO by TROPO propogation. 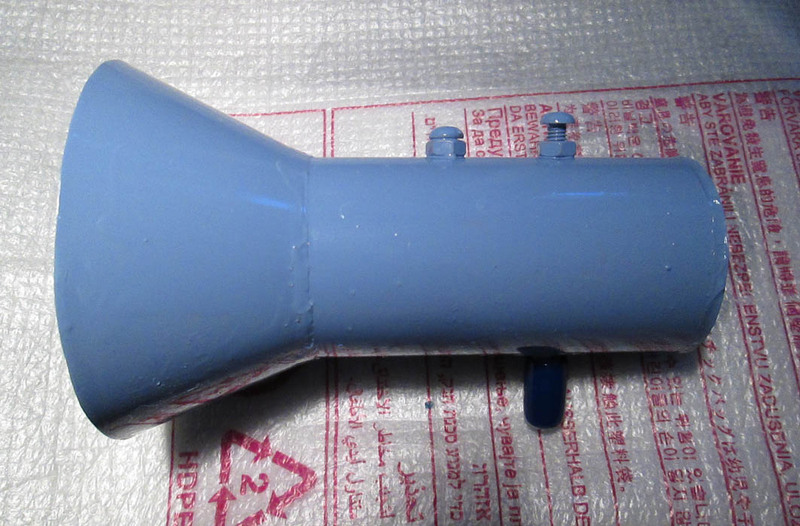 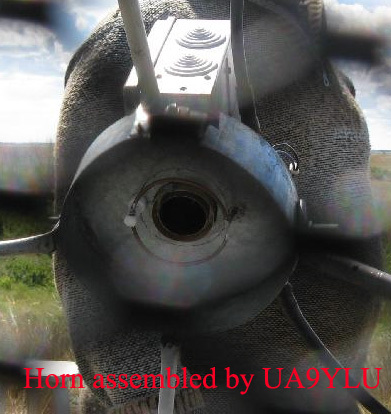 I made dual band feed horn with loop feed of 23 cm and additional horn of 6 cm band. 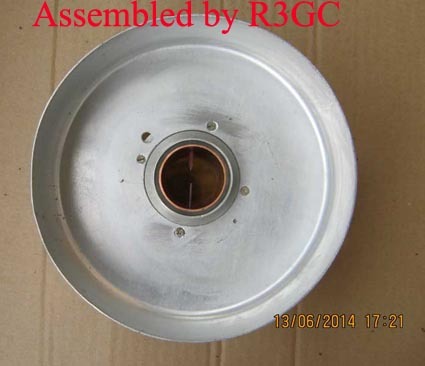 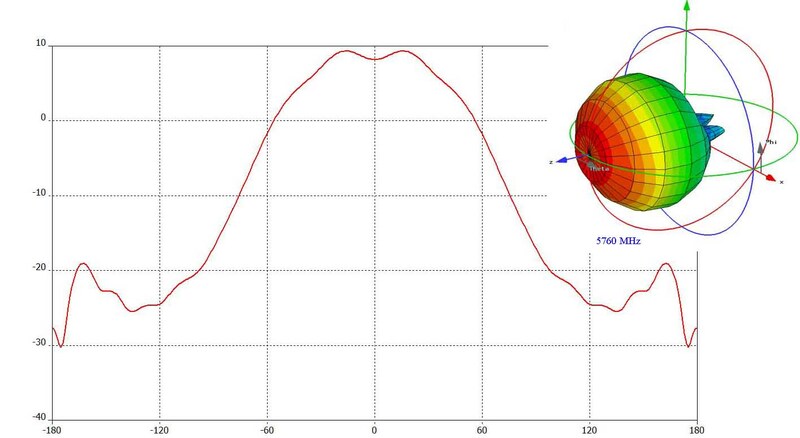 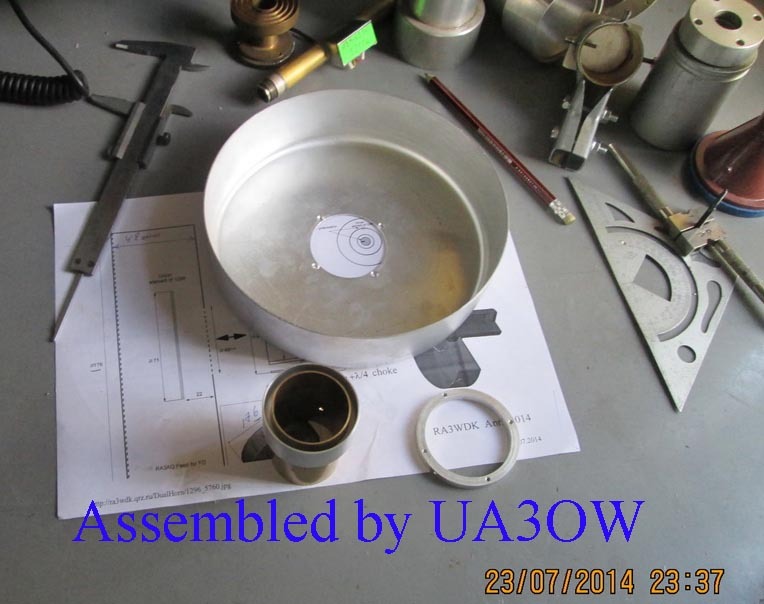 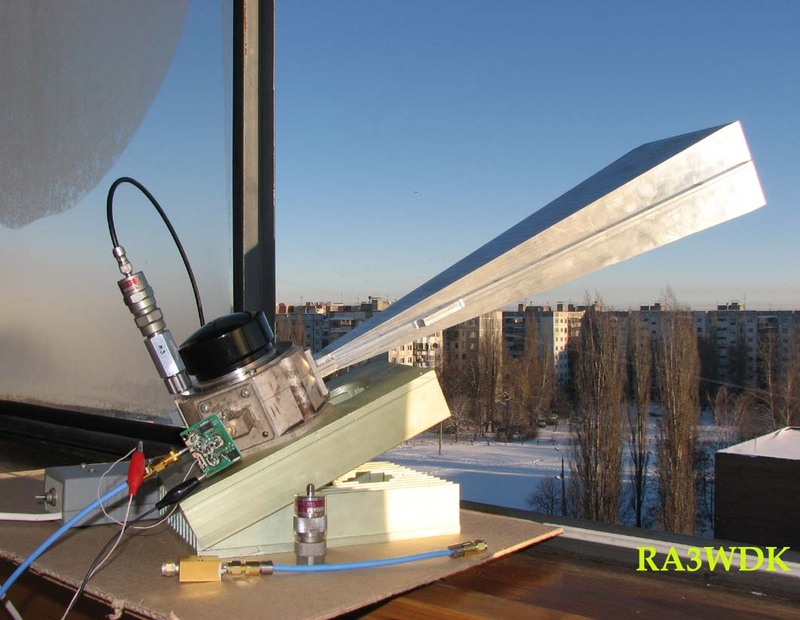 This configuration is also simple and has necessary radiation pattern for illumination dish with 0,3-0,42 F/D. 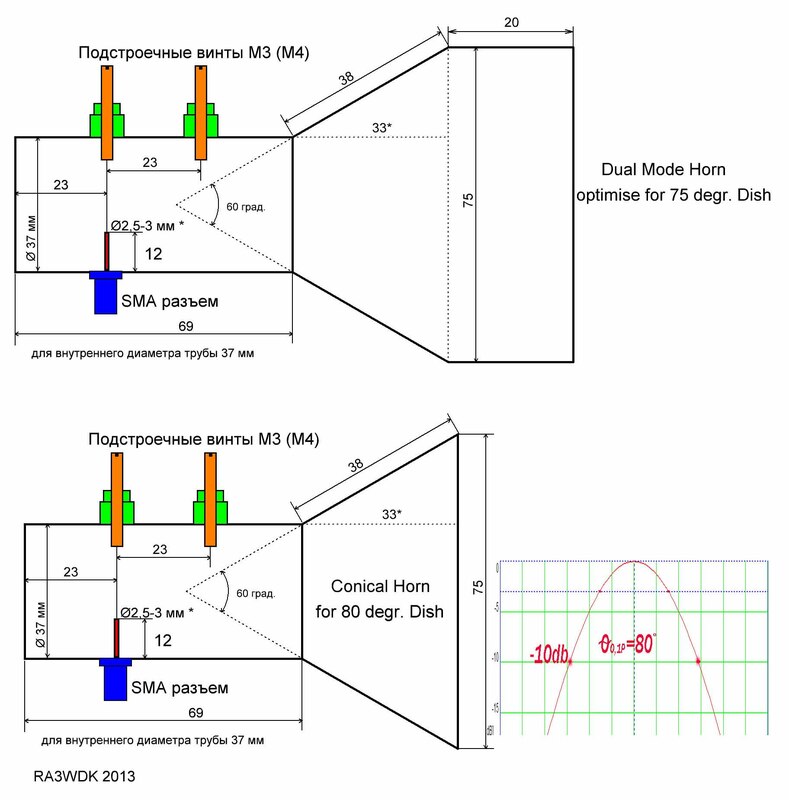 The dual feed horn has separate input for both band. 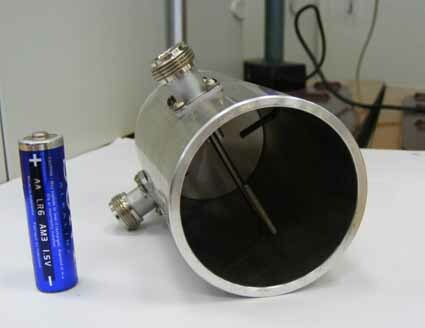 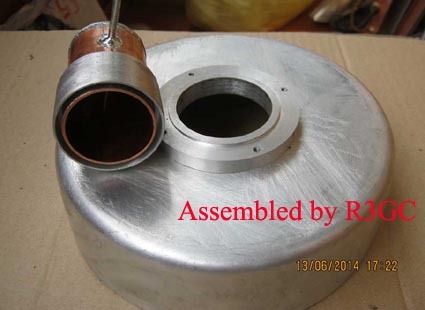 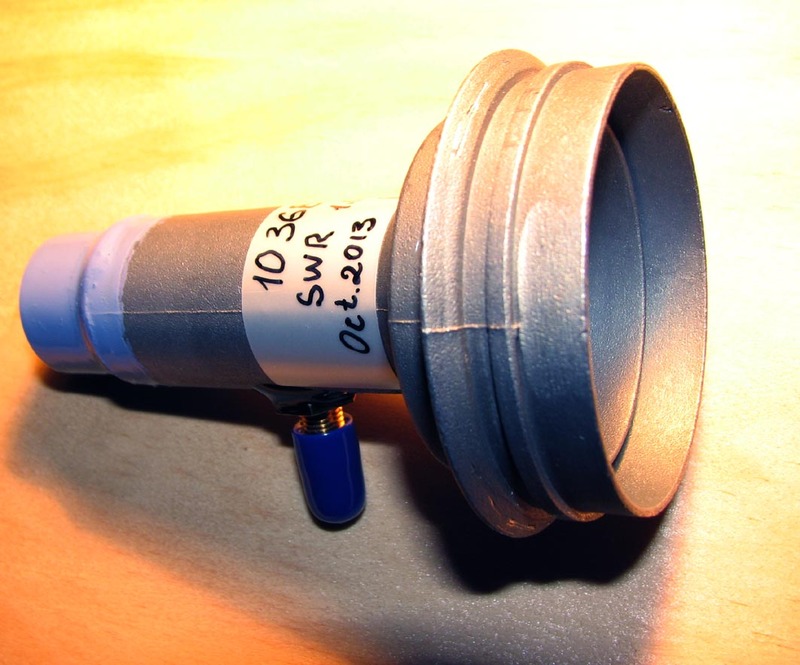 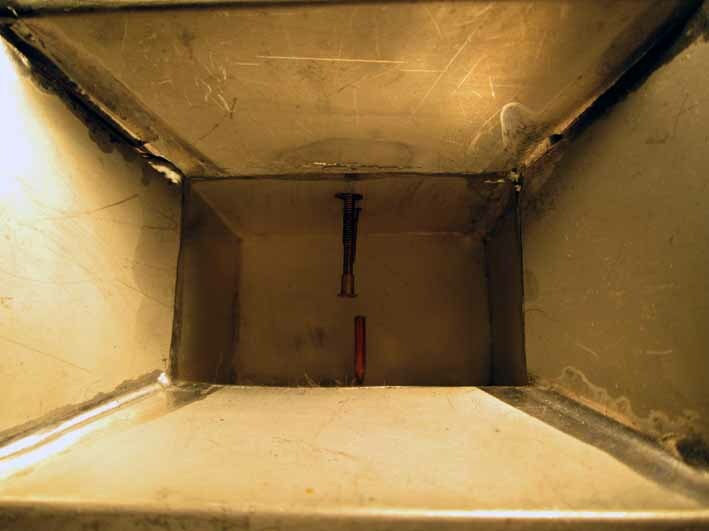 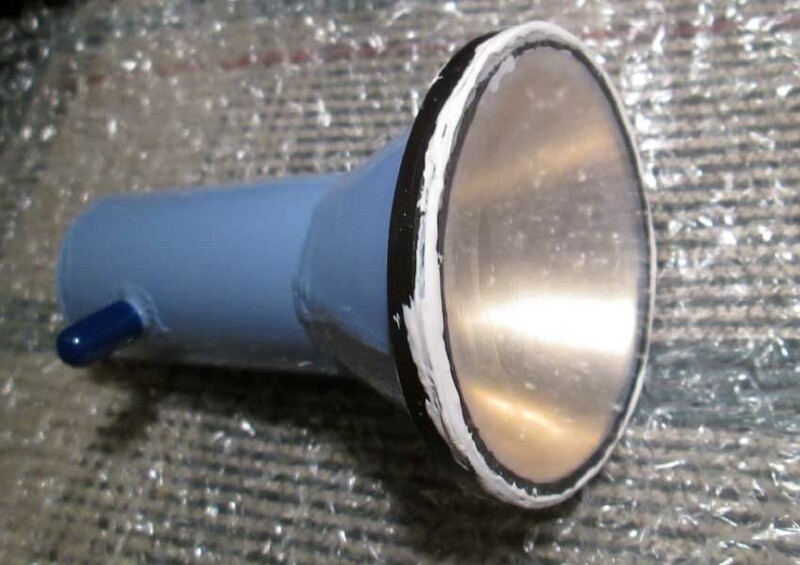 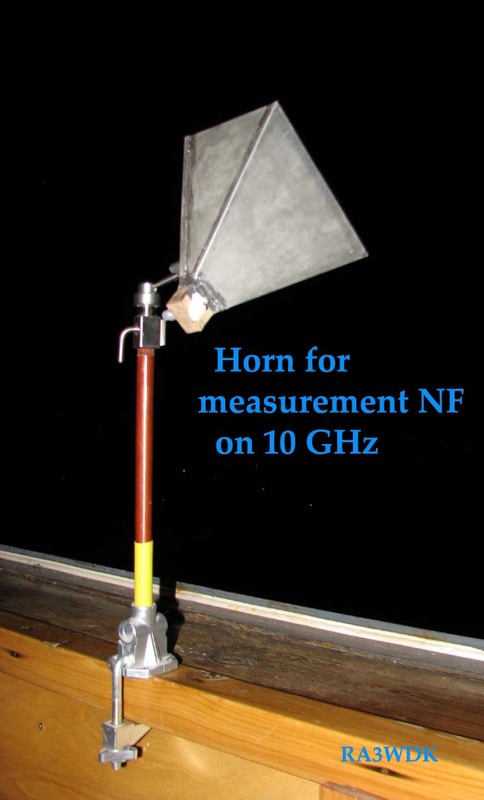 The small horn of 6 cm is located inside and behind reflector of loop feed. 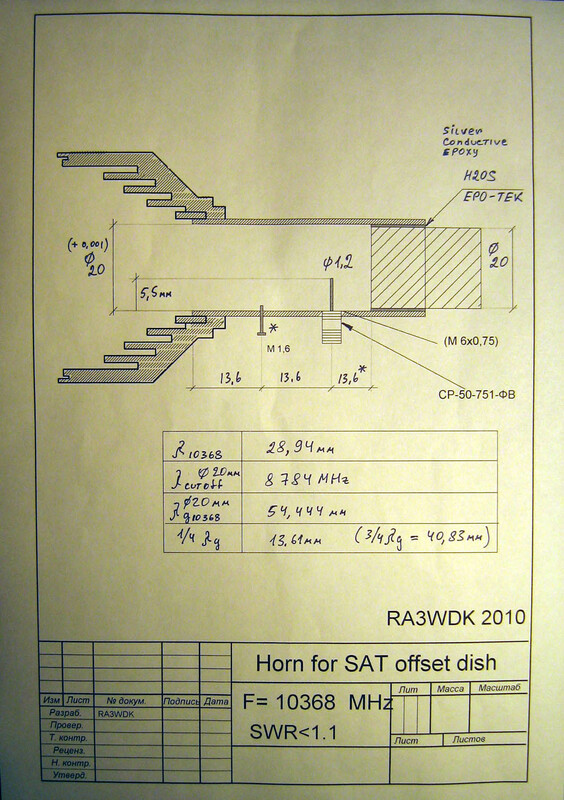 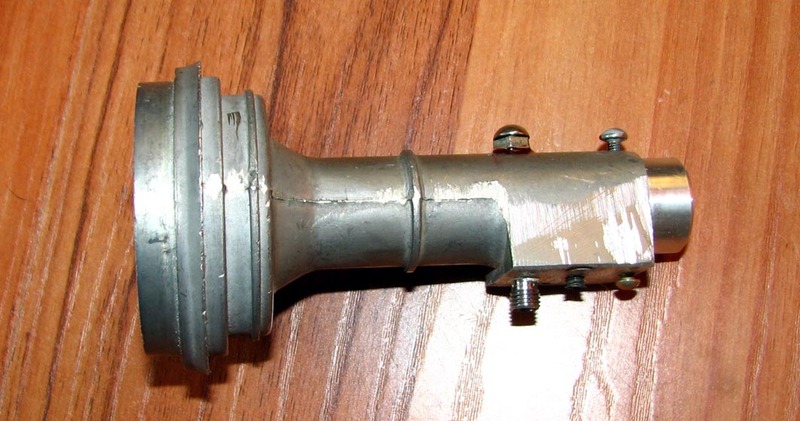 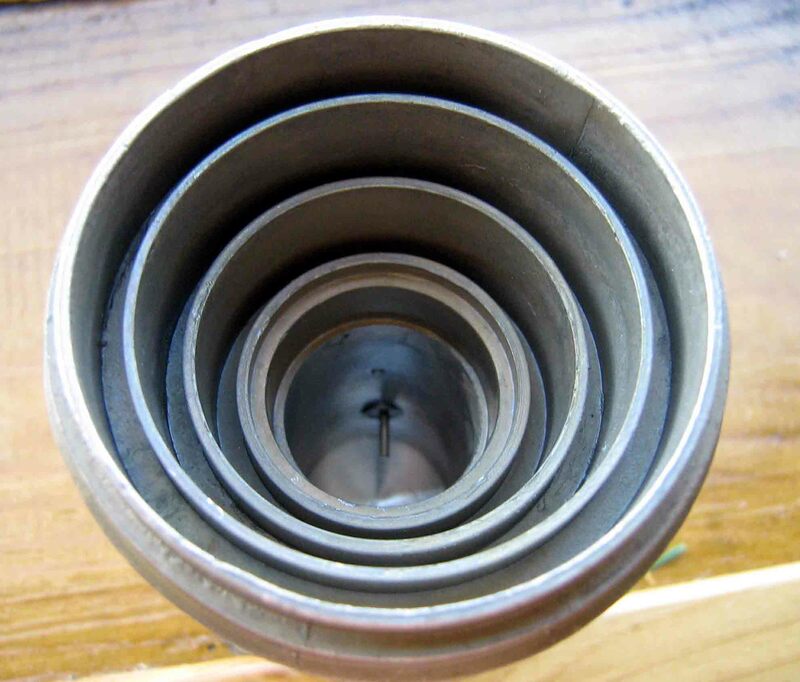 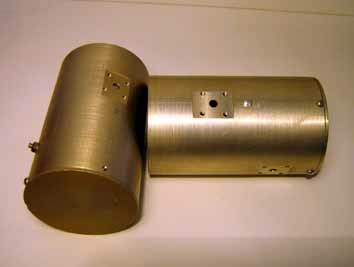 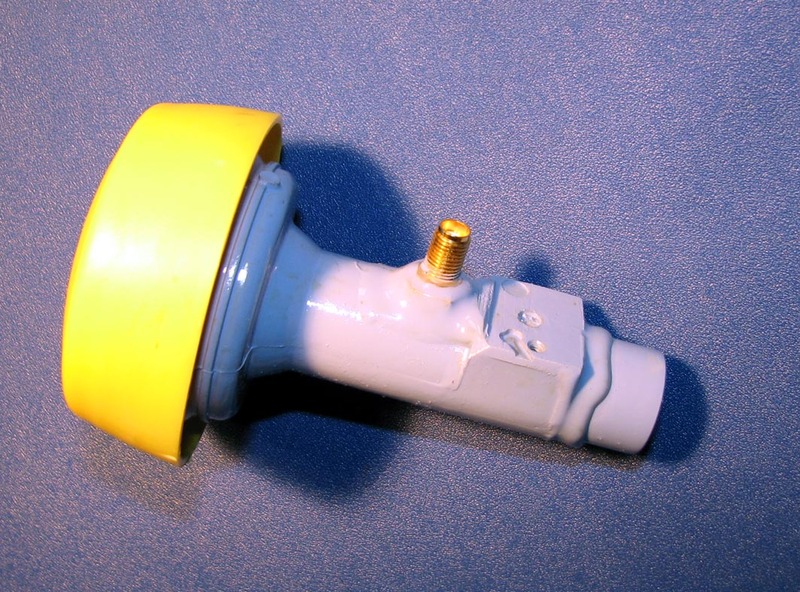 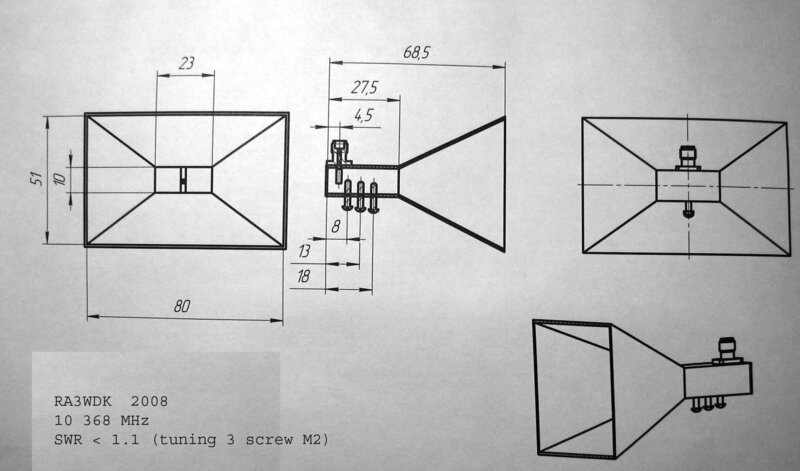 Part of feed horn of 6 cm using axial choke at the open end of the waveguide and has not influence for part of 23 cm. 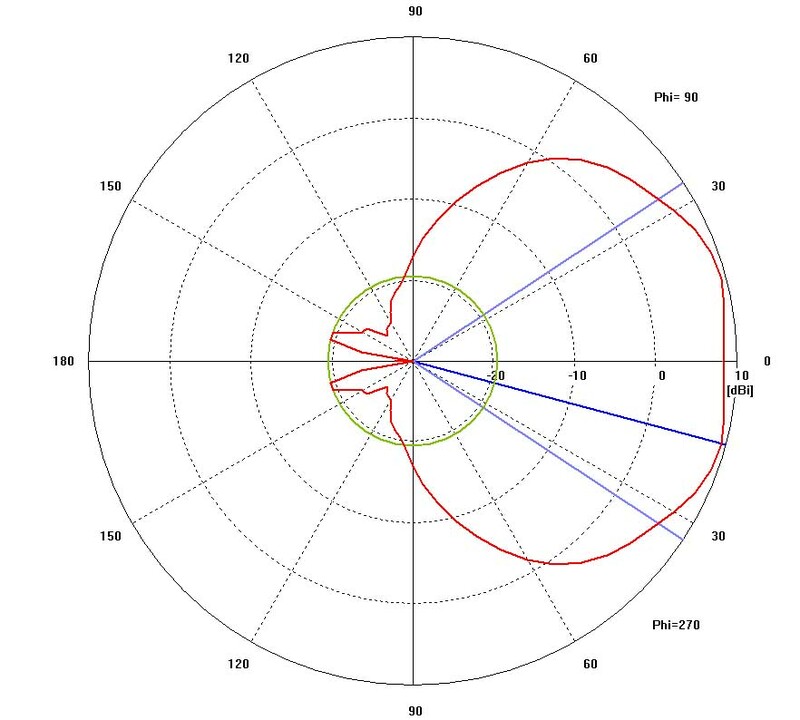 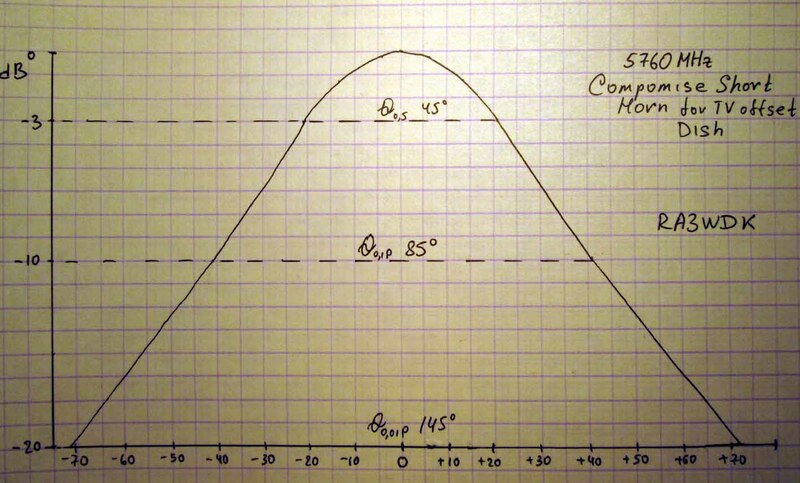 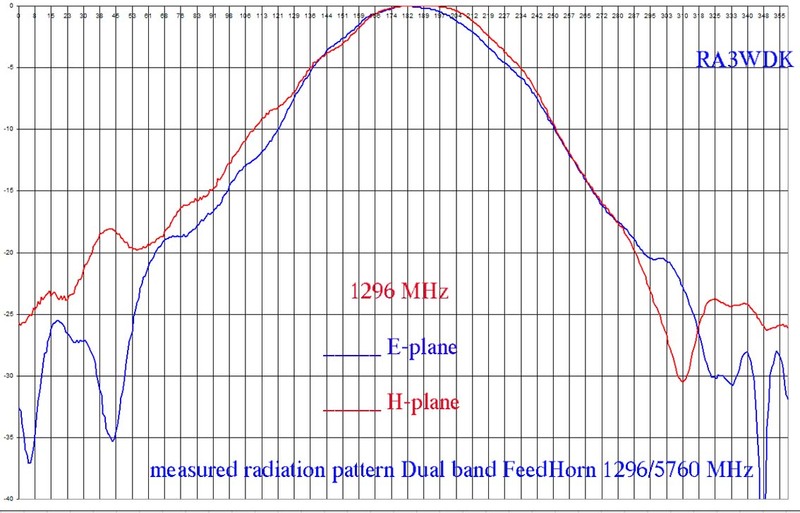 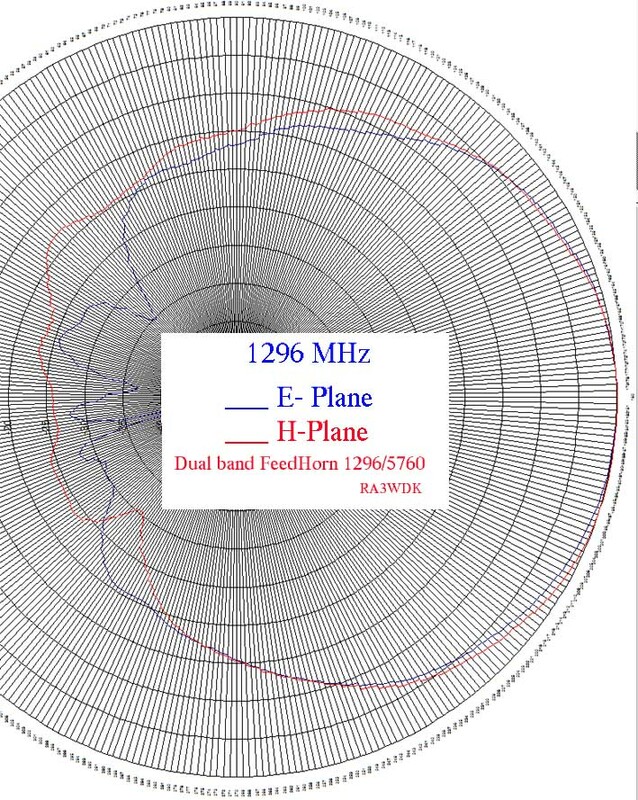 The radiation pattern in Figure below shows that the main lobe for 23 cm band has beam width about 130 degress and for 6 cm - about 110 degress. 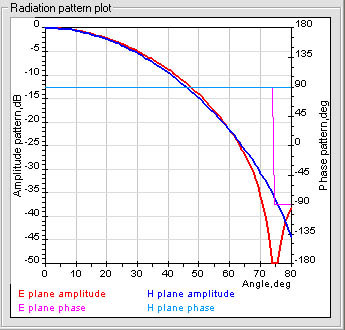 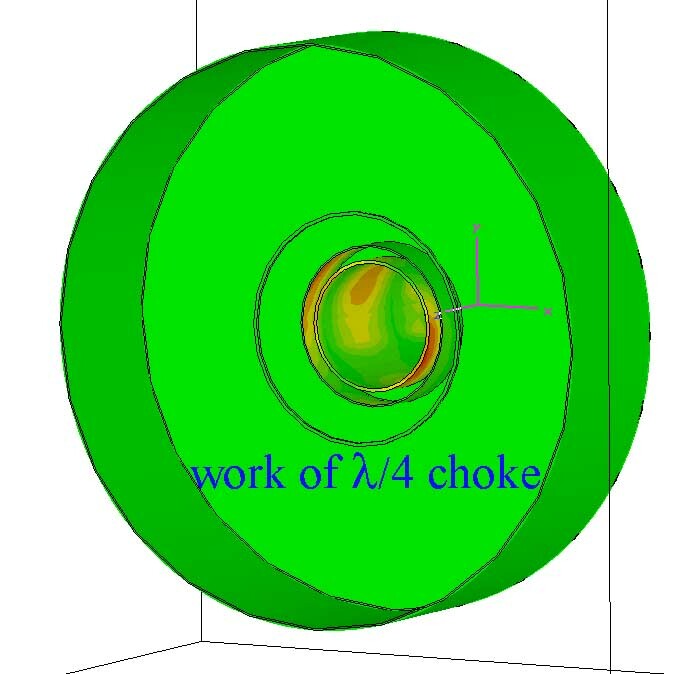 The radiation aperture such as the open end of a rectangular waveguide and loop has near of equal beam width pattern in E and H plane . 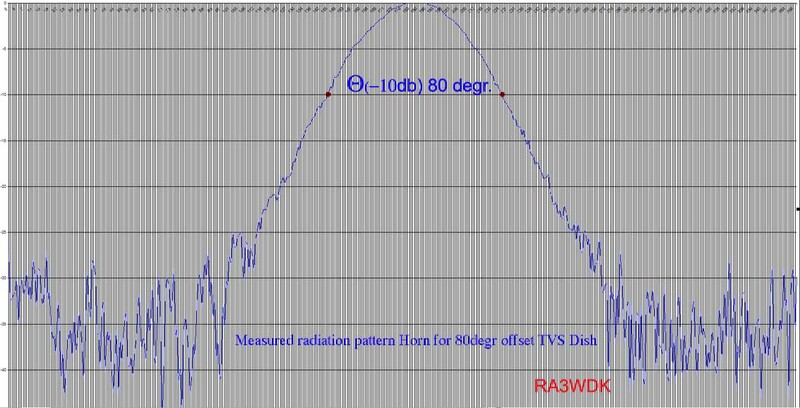 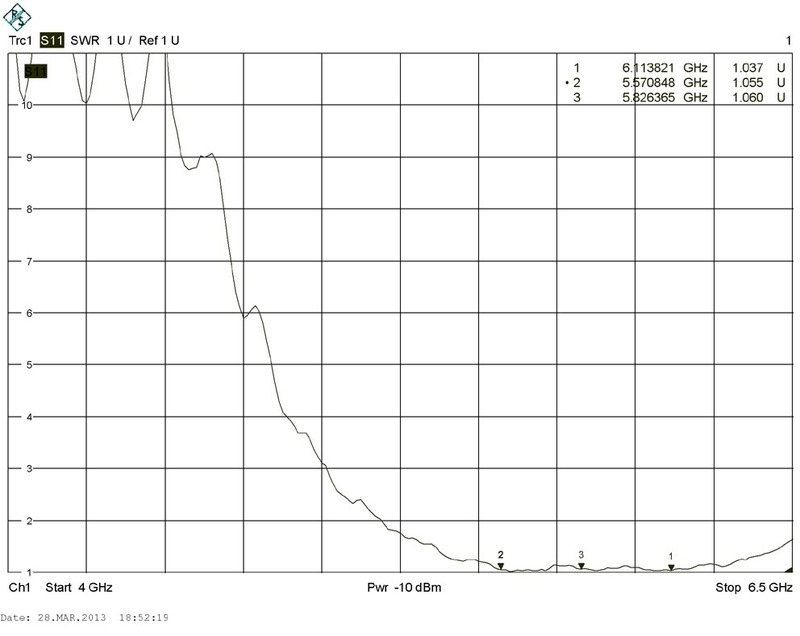 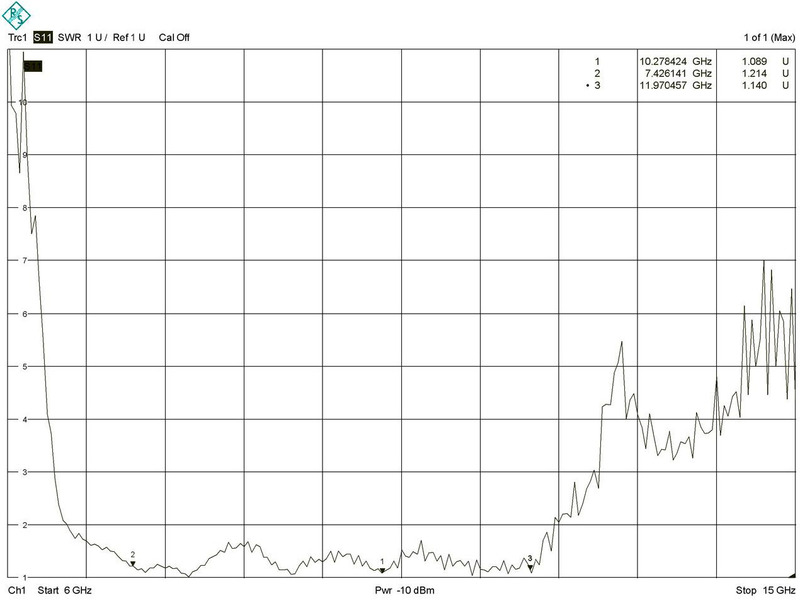 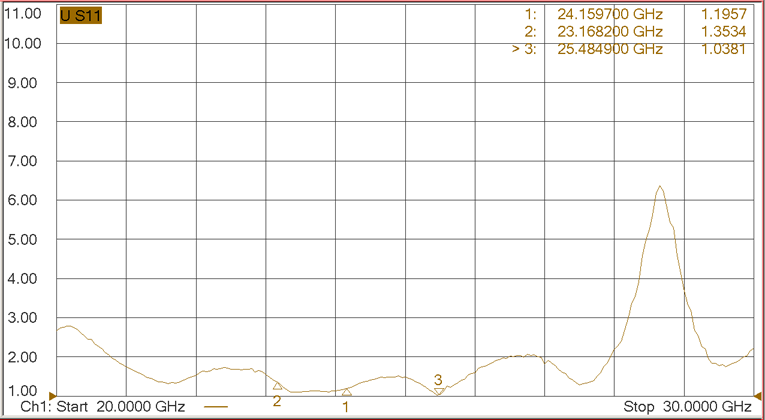 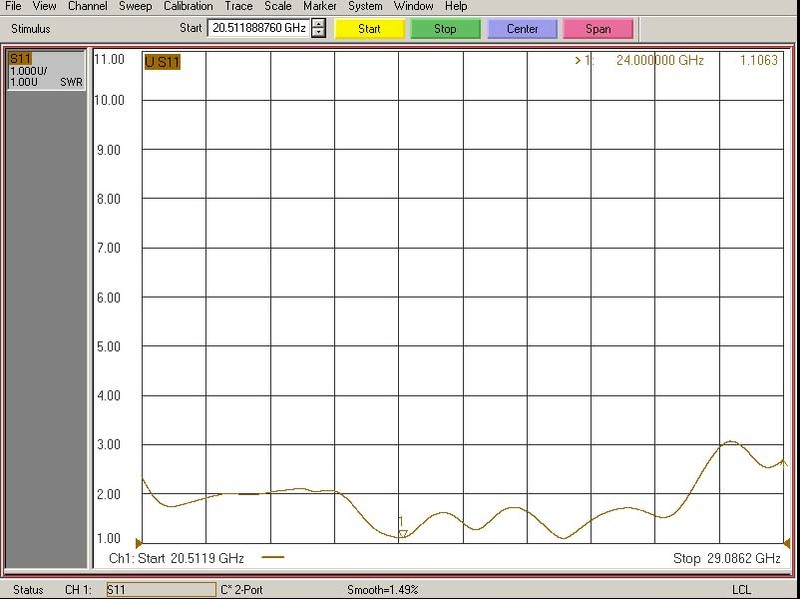 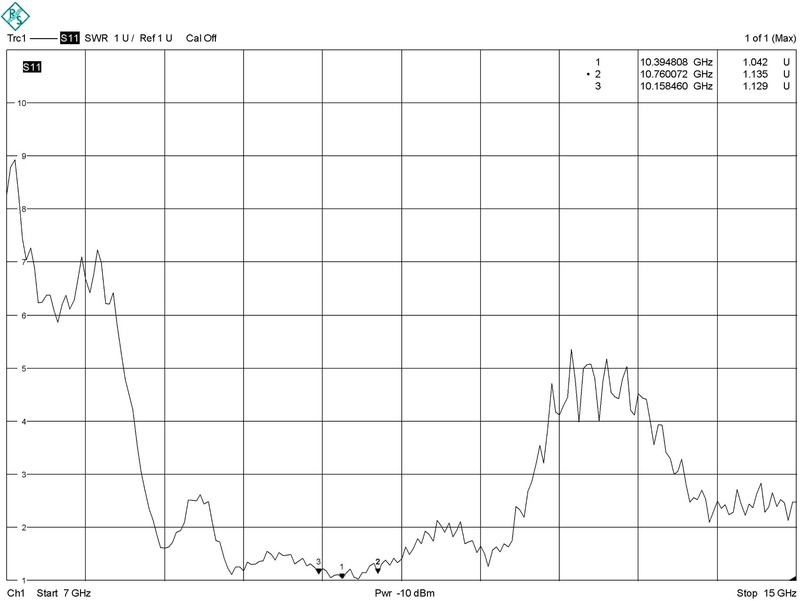 The backward radiation of this feeds has good suppress and level sidelobe is low . 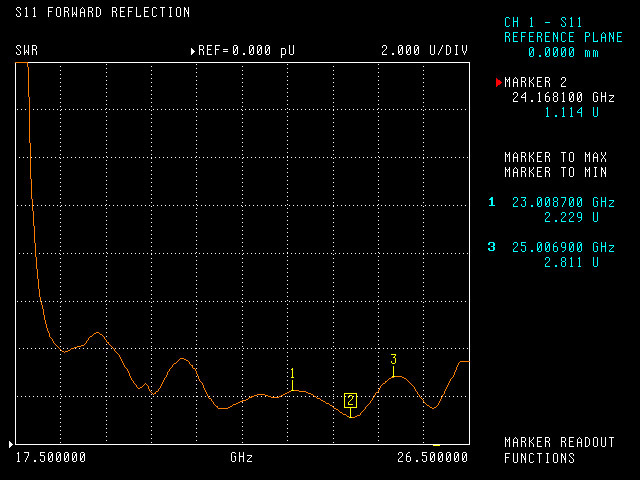 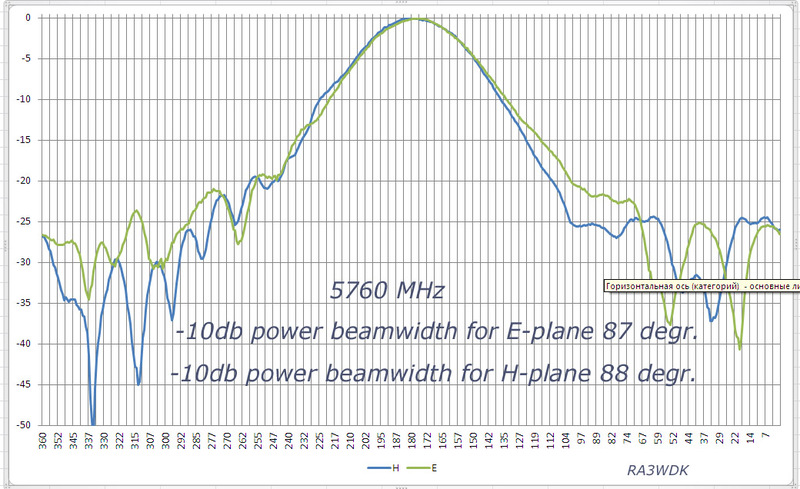 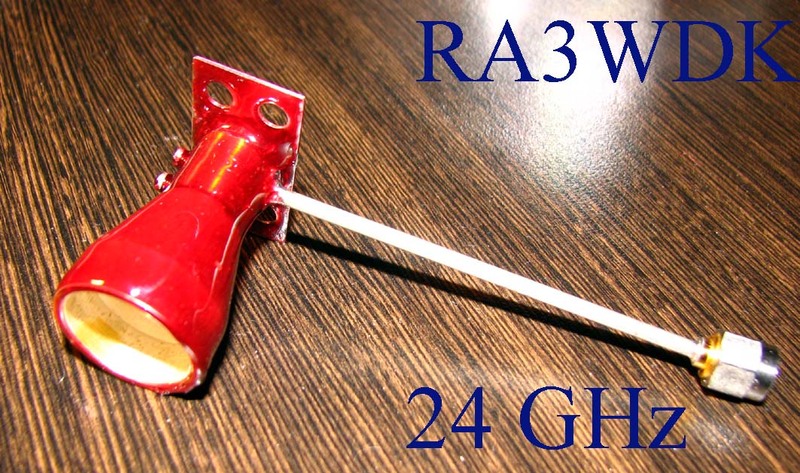 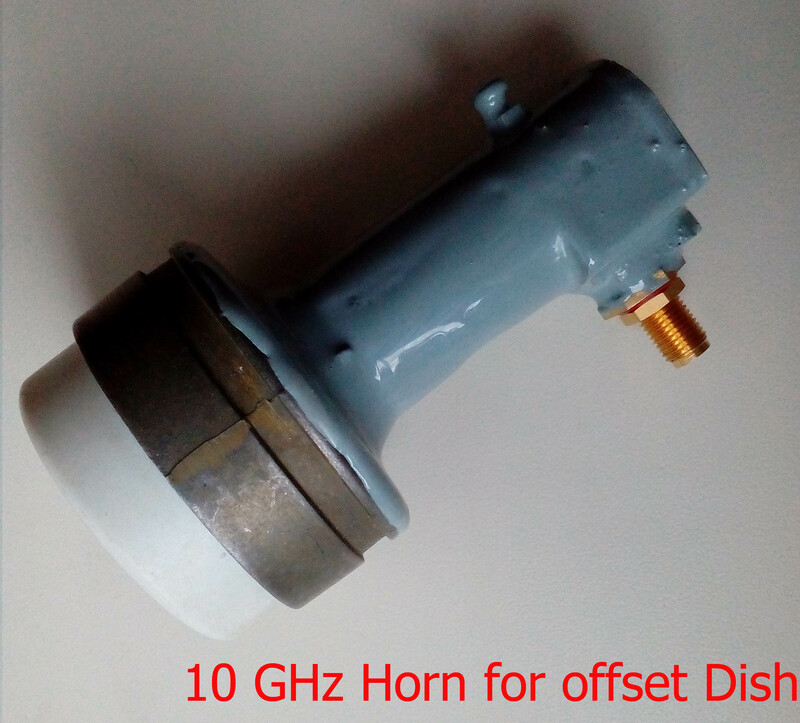 Feedhorn for 1296 MHz has been made by RA3AQ and later I added feedhorn for 5760 MHz . 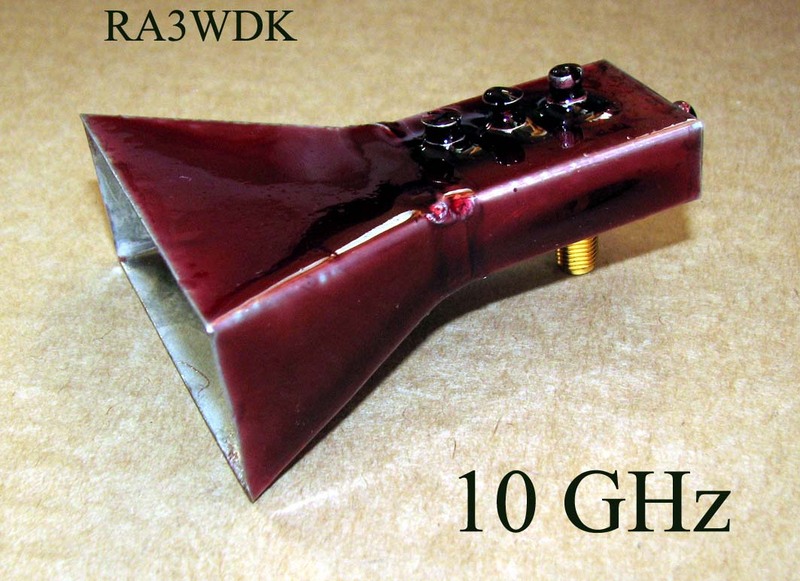 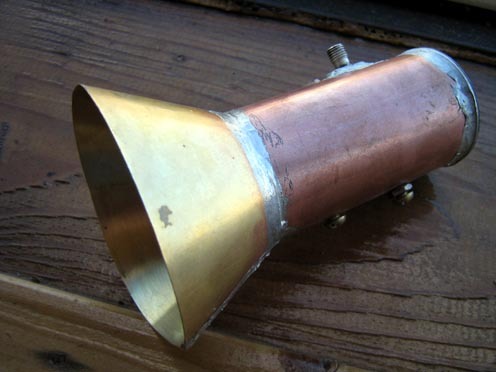 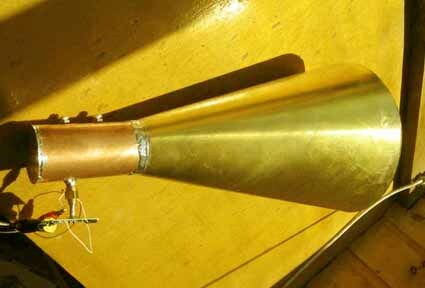 Vladimir R3GC made this Dual Band Horn. 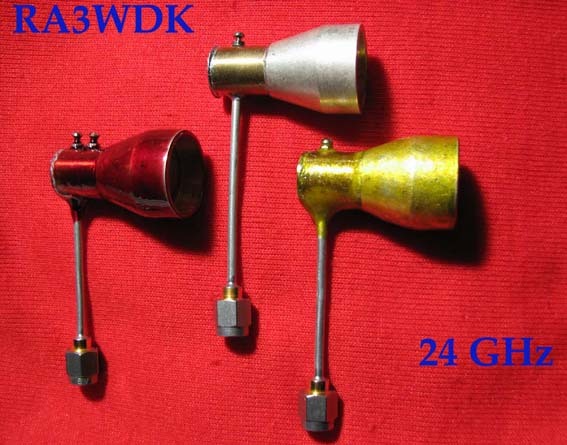 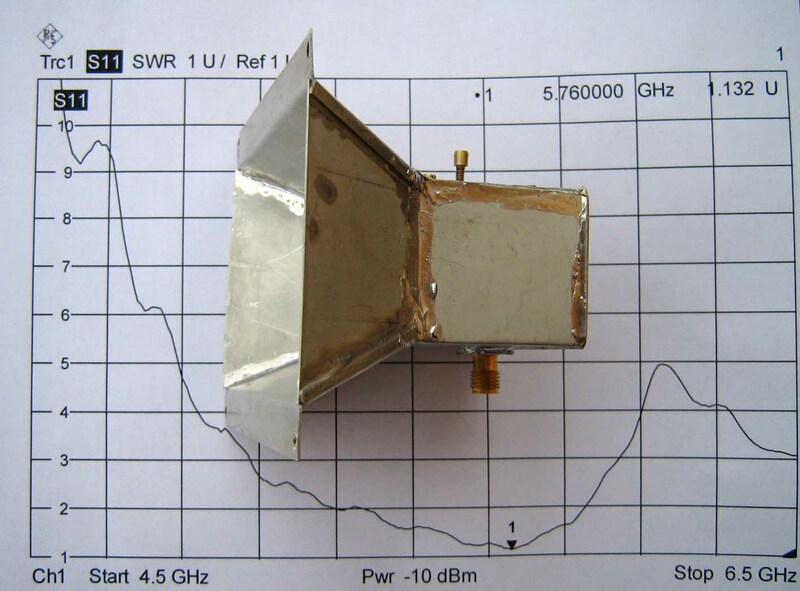 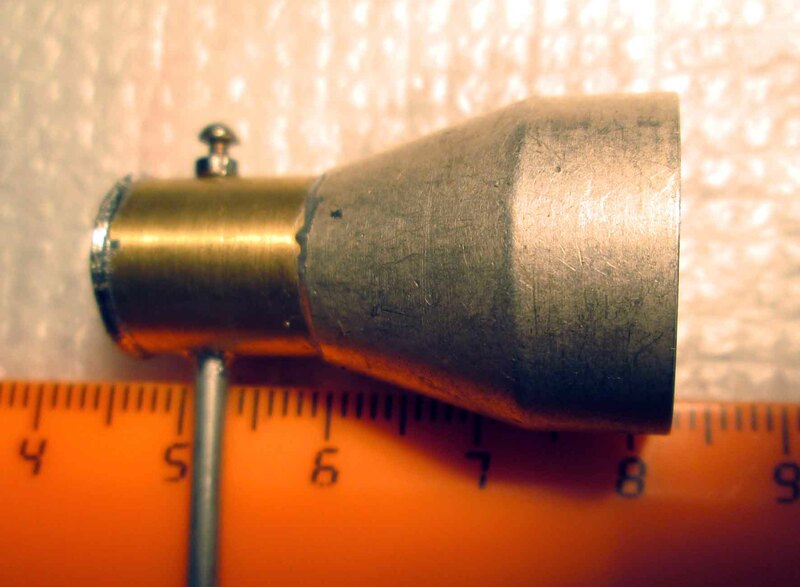 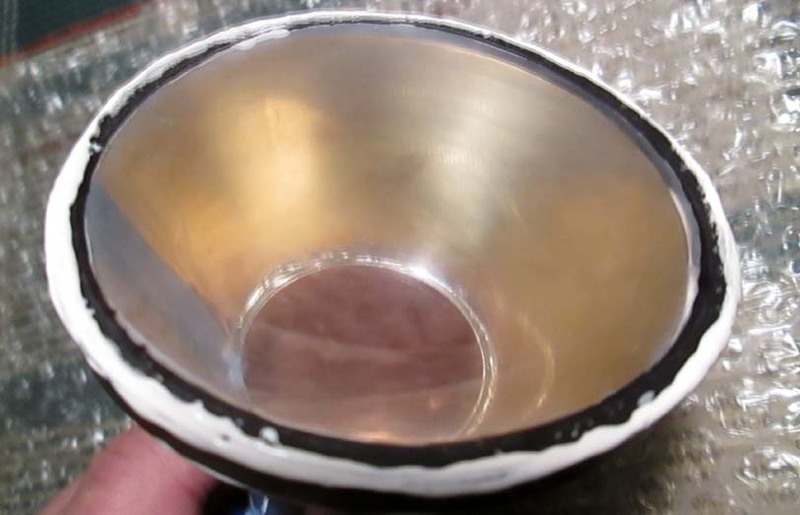 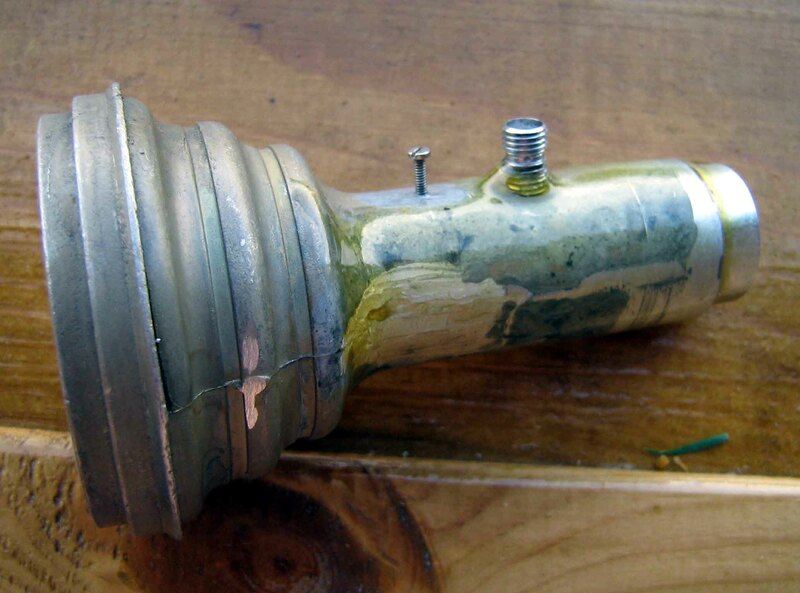 He used saucepan for reflector of element 1296 MHz. 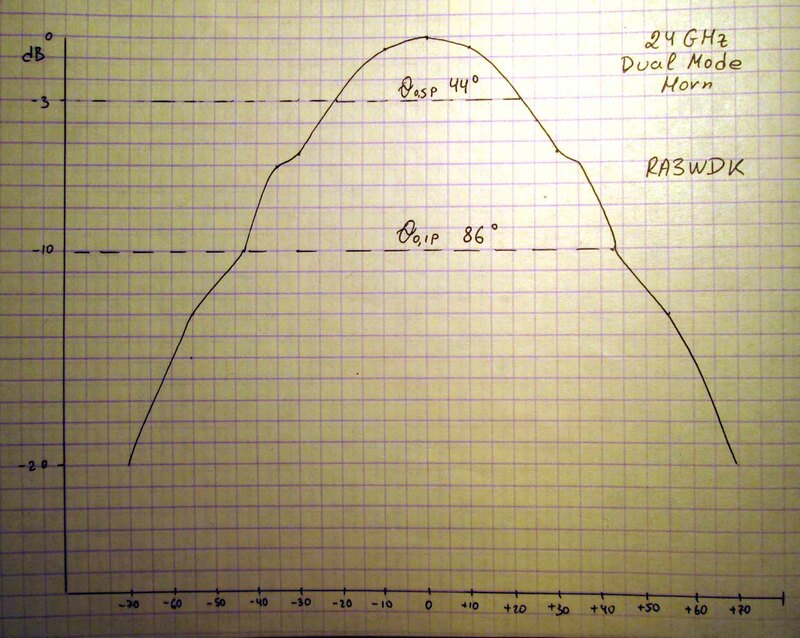 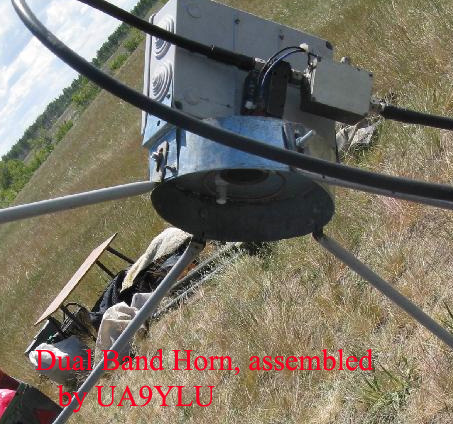 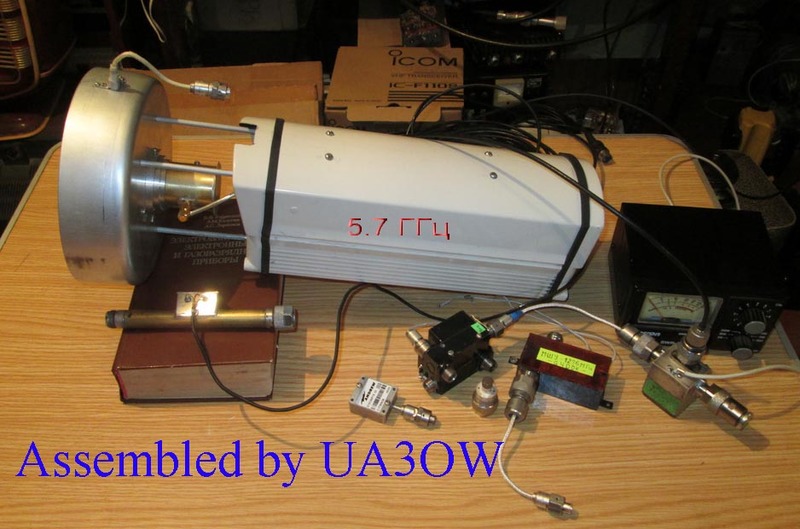 Alexander UA3OW made this Dual Band Horn. 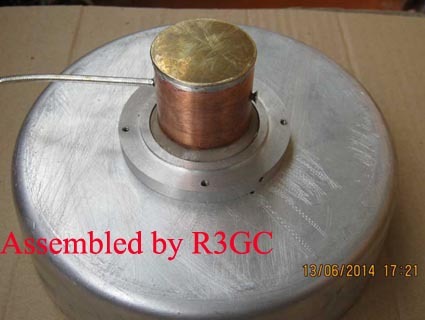 Increase in internal diameter to 20 mm !!! 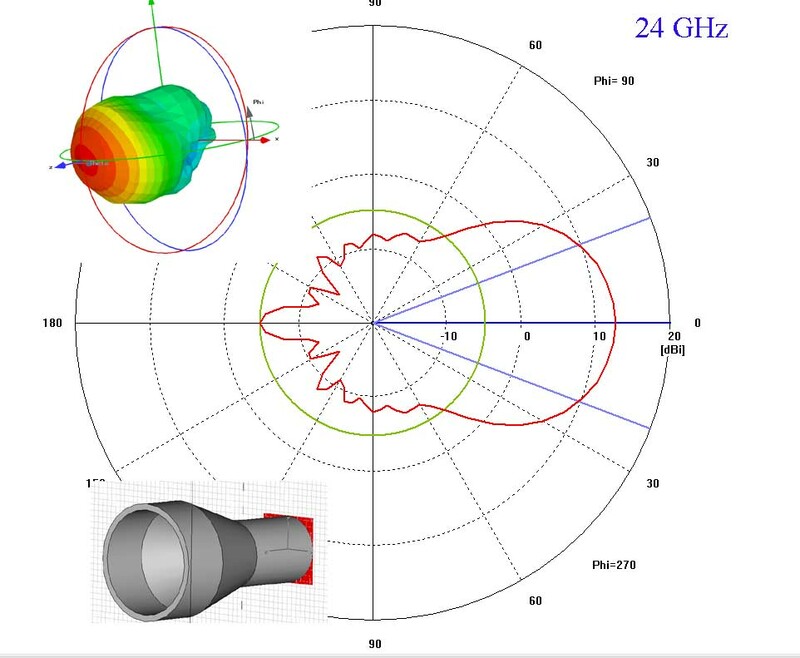 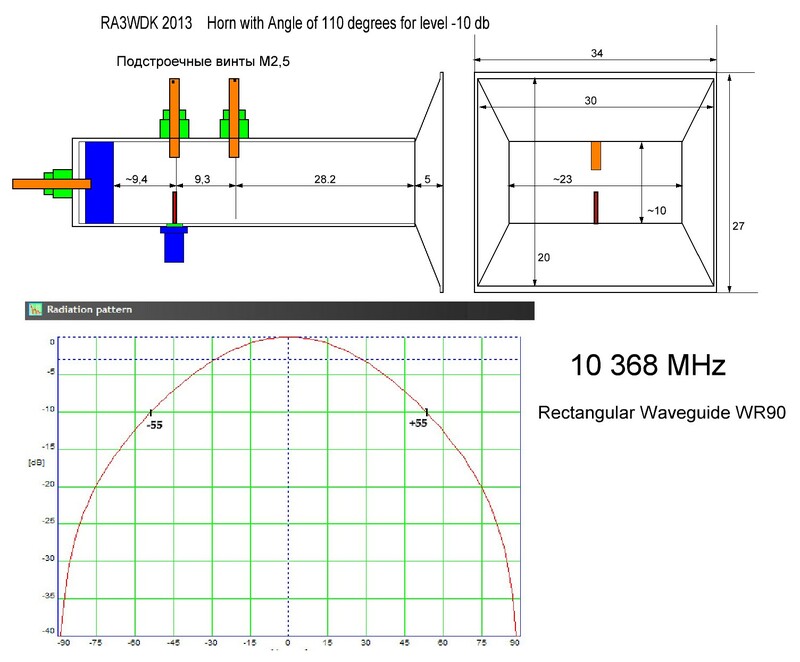 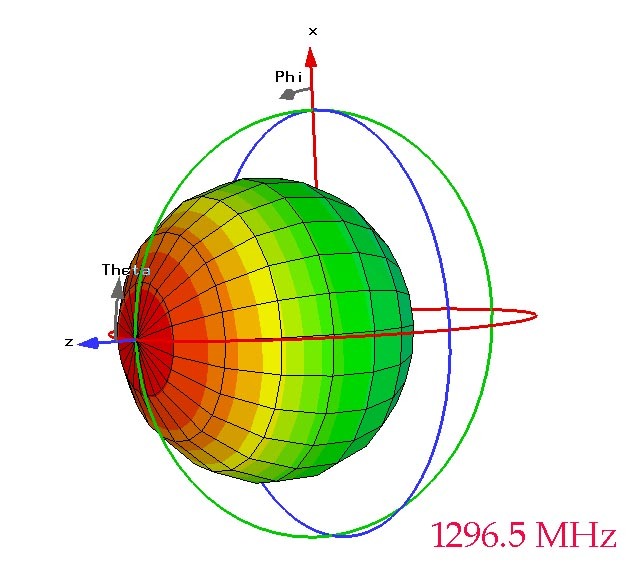 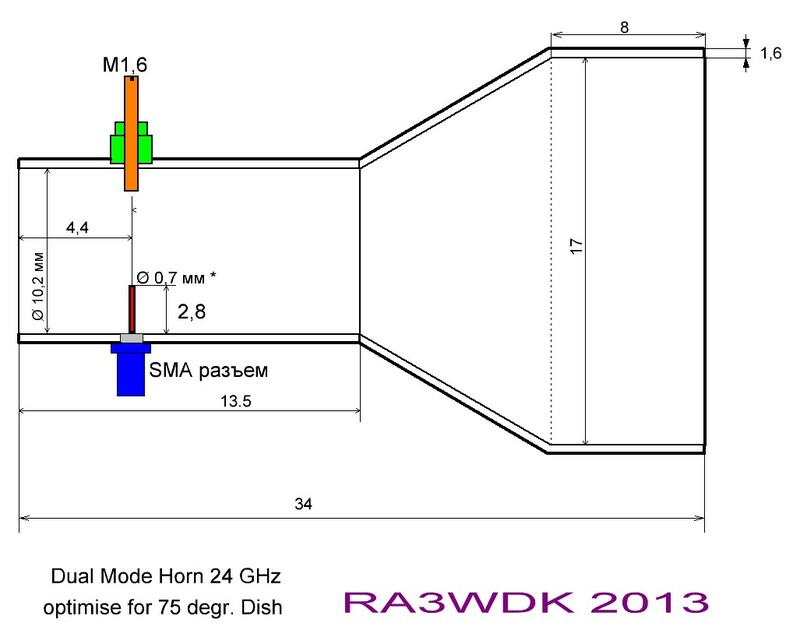 Multi Mode Horn with Bi- Orthogonal polarization for Offset dish, 5,1-5,6 GHz for Wi-Fi.